Helping someone else = a lovely give-away for you! I read over on Erin Russek’s blog earlier this week, that’s she’s created this gorgeous dresden plate with appliqué pattern and all proceeds from sales are going to help a little girl, Miss Kyra, and her family in need from Erin’s local community. Erin is one of the most generous quilters I know and I wanted to lend some support too. I was very touched by Kyra’s story. So, I purchased six copies of Erin’s pattern, all proceeds are going to Kyra’s family. I’ll be keeping one pattern for myself and have five to give away here. I don’t know about you, but I feel guilty that I don’t have the time in my life right now to offer more support to the wonderful quilting charities out there. So, when I see an opportunity that I can do a small part to help, I’m happy to do it. Erin is selling her pattern for just $5.00… a steal if you ask me. You can find it in her Etsy Shop. I’d like to encourage you all to purchase the pattern and help support Kyra. I have five copies to give-away. If you purchase the pattern yourself, awesome! Still enter my give-away. If you win a copy from me, give it away to one of your own blog readers or to a friend. You don’t have to purchase Erin’s pattern to enter my give-away … it’s just a suggestion! To enter my give-away, leave a comment below telling me if do any charity quilting or help out others in your local community. Again, it’s not a requirement that you do charity work to win … I just love reading your stories. Thanks to Erin for her generosity.. it’s quilters like her that make me smile and love the quilting community. I’ll pick my five winners next Friday, March 16th. I have made numerous Quilts of Valor. My husband served 23 years in the US Navy – so near and dear to my heart. Love the pattern. Hope I get it. 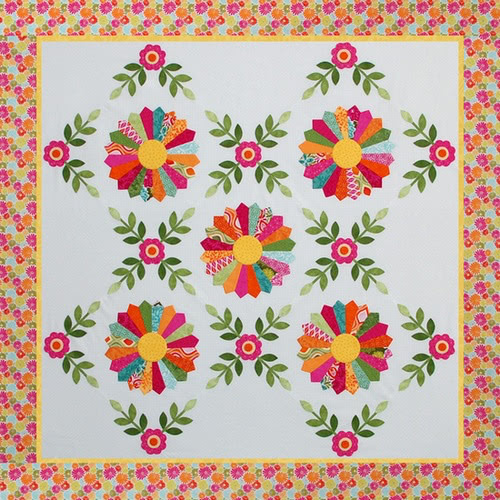 Love this pattern and would also love to win a copy. I’m working on a stack of preemie flannel quilts for a local hospital. I’ve also done a couple QFK quilts. Once I get caught up on projects I’ll be making a Quilt of Valor. One of our LQS sponsors a program that provides them to vets in a local nursing home. Thanks for the chance to win the pattern! I don’t have time or resources to do charity quilting. Hopefully in the future I will. Our local stitching group does several quilts a year for various causes. We do quilts for our local Quick Response Unit to carry in the ambulance, donation quilts for raffles to benefit the local historical society and for the Community Hall to raise funds for much needed upkeep. This Hall is used by almost everyone in the community for a variety of things-including our quilt group which meets there twice monthly. We donate fabric, piecing, longarming & binding, everyone contributes. a friend is doing quilts of valor, for the military and I’m hoping to take part in that. I have made many pillowcases, blocks, and quilts for various charities. Some of the groups I joined were via the Internet and most of them were in support of our military men and women. That is a cause that is very near and dear to my heart as my Son is military. I also give locally, and two of my favorites are the domestic violence shelter and the other is an organization that helps the elderly. I believe strongly in giving to others and will continue to do so as long as I am able. Love the pattern! I have a long arm and quilt some of the tops made by others in the “Stitches of Love” group that donates quilts to foster kids in our area. I would like to win this beautiful quilt pattern. I have made blocks for the wounded warriors and various other small charity gifts for people on my on-line quilt groups. My guild gives away comfort quilts to local community members in need, and I try to donate one quilt a year to this effort. Unfortunately, as a hand quilter, my finishes are few and far between, but I have met my goal most years. Thanks for the chance to win! That’s a beautiful pattern that Erin designed. My daughter was adopted from Korea in 1988. We were able to make a trip there in 2005. We took many little quilts – some I had made, others had donated, and some I made from blocks and fabric donated to me. We gave them to the agency from where she was adopted. Each year I try to make a few little quilts for them from blocks that adopted children decorate at Korean Heritage camp in the summer. I like doing charity “quilts”, but mine are often not quilts. I do landscape scenes on towels and donate them for the silent auctions that charities have. Next week is the Empty Bowl Supper for the homeless in Calvert County and the silent auction is always a hit. It really is fun to let my passion help another need. If I don’t win the pattern, I will buy it because it really is pretty and goes to a good cause. Thank you for sharing the story. I am a machine quilter and I love to do charity work. I get to experiment with my quilting, and do what ever designs I choose. The funny thing is that those quilts usually end up being the ones I like the best. I have been making cage mats for the Local SPCA and these mats go with the animal once it is adopted so they have something familiar to take to their new home. I love animals and since I can’t afford to join a Guild and I also don’t drive to get to one lol this is something I can do on my own for my community and I love animals. I normally just make items to donate to our church for a bizzaar in December of every year. The proceeds go to our sister church in Mexico. When we go on our Mexico Mission trip each year, we are amazed at what they did on or around the church with that money. It just makes us want to make more and donate it. This year, our daughter came to me asking me to make my grandaughter who is in Kindergarten a quilt to donate to their carnival to be raffled off so they can make money for their school. I said ok. That is the first quilt I have ever quilted on top of, and It turned out stunning. There were three Kinder classrooms that signed their name on some fabric that I had given to them. That yellow fabric was bordered with navy blue, and on the front, I made 12, 12.5 inch pinwheel blocks. The whole quilt was made with their school colors. I wish I could post a picture, it turned out great. My daughter says that she wants one now. I guess we all will be buying some raffle tickets for that. There are so many quilters on here that deserve the patterns. It just amazes me how they have the time to make and donate a quilt as often as most of them do. I applaud you all. I homeschool my 7th grade grandson and quilt daily, I still do not have time to donate any of my work. It is all for christmas presents for my family. I just make some items for our church for a bizzaar @ Christmas time. That wears me out enough. I am inspired by all of you who have commented on here. Keep up the awesome work that you do. I’ve been coordinating a charitable knit/crochet group for a few years now and am expanding into my real love – quilting – for charity and hope to get a group together for that. Currently working on a quilt to give to a friend’s guild who does massive charity quilting. Our quilt guild is supporting Quilts of Valor and making pillowcases for service people. I have been helping with this. Thanks for the chance on Erin’s lovely pattern! What a beautiful pattern. I love Erin’s patterns and her work is gorgeous. Our quilting guild make community quilts. Many go to women’s refuges for the mother’s and their children who have fled their homes with nothing. I just moved to my area so I really don’t know anyone yet. I have contacted someone in the 4H club and am trying to volunteer there. I have never been involved with any sort of charity quilting, however I would like to make it my goal! I think it is an awesome way to give of yourself! Alot of hard work and hours go into making such a wonderful gift. Blessings on those who do charity quilts! What a gift of love!! I do quilts for Project Linus. Most of my quilts are donation quilts or gifted to friends – not that long ago I finally kept one for myself… BASCICS from V is the charity I love to support and QoV. Thanks so much – what a great idea of selling patterns for charity/ Kyra! Jeg ville elske at vinde, men det kan jo også købes. Our little group of quilters in my town make baby quilts which we give to the nursing station to give to new babies as they see fit. We also make quilts sometimes for people who give a lot to our community. I have made some charity quilts for online organizations but I’ve found that sometimes there isn’t even an acknowledgement that they have received items, which has turned me off a bit. I do a lot of volunteer work in my community. I live in a small town – 450 people – and there is a small cadre of volunteers who help with everything. But I know volunteerism is disappearing a bit. LOVE the pattern. I’m goint to buy one for myself. If I win I will donate it to my guild for a prize. Everyone will want one too! My quilting guild makes charity quilts for Women and Children”s Shelters, for children in community that have sickness,lost family members,etc; also for babies that need heart surgery at local hospital and soldiers of valor quilts. I have made 4 quilts for friends with life threatening illness or terminal cancer. I love quilting and the joy it gives to those who need joy and happiness in their lives. I think that dresden plate pattern is a beautiful rendition of a dresden plate. I have made a regular dresden plate quilt in the past.